You're Invited to Watch Graduate Students Compete in GradTeach Live! (Left to right) Francisco Luque, Kateri Kate Miller, Jannell McConnell Parsons, Kathryn Kohls, Malinda “Lindy” Massey, Corinne Gressang and Kayla Bohannon. 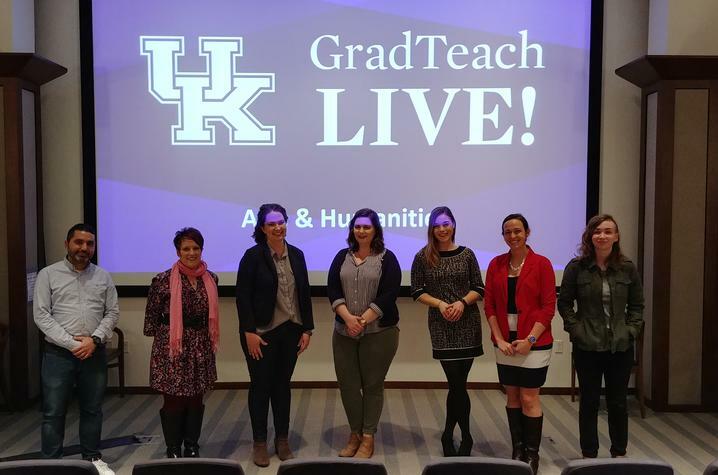 LEXINGTON, Ky. (April 5, 2019) — The campus community is invited to attend the finals of GradTeach Live! The competition, hosted by the Graduate Student Professional Enhancement Office and the Center for the Enhancement of Learning and Teaching (CELT), highlights the valuable work of graduate teaching assistants. The preliminary round took place on March 19. Now, 14 participants will be vying for cash prizes in the finals from 5-7 p.m. Tuesday, April 9, at the Worsham Cinema located in the Gatton Student Center. Through GradTeach Live!, current and former graduate teaching assistants can showcase an aspect of their teaching philosophy and how they put it into practice. The challenge? To present in a way that captures the attention of the audience, just as it would engage the attention of students. But there's a catch — each presenter is only given a maximum of five minutes. "Graduate teaching assistants are a vital part of UK's undergraduate teaching mission. GradTeach Live! celebrates the dedication of teaching assistants to undergraduate education and recognizes the diligence in which they balance their own course work, writing and research with teaching,” Ashley Sorrell, assistant director of the Graduate Student Professional Enhancement program, said. In addition, the event also aims to help graduate students prepare for the academic job market. "By challenging them to identify and clearly communicate an aspect of their teaching philosophy to an interdisciplinary audience," Sorrell explained. "They are honing their skills in public communication, cross-disciplinary engagement and critical reflection, which are transferable to diverse career options." Yunzhe Zhu, agricultural economics, "Teaching your Students? No, Entertain Them! : How to Improve Attendance of an Evening Class." Cash prizes will be awarded to the first, second and third place winners. Audience members will also be able to vote for the people’s choice winner. The mission of The Graduate School is to promote excellence at all levels of graduate education. By encouraging and supporting the acquisition and dissemination of knowledge in an environment of diversity and interdisciplinary cooperation, graduate programs prepare students as future leaders of the global society in research, teaching, applied science, creative production, policy making and public service. CELT supports excellence in teaching and learning by working collaboratively with all instructors to create engaging, innovative and inclusive learning environments in which diverse students can excel.